In an earlier post I wrote: “Life being good is maybe one of those deep dark profound and scary secrets that virtually nobody in America really believes anymore…”. Now I’m sure some readers ran right over that without hardly a second look, but others might have stopped and thought: Really? What is this guy talking about? How can it be “scary” for life to be good? What is so “deep and dark” about that? What most of us really believe is that it’s good to be comfortably sheltered from life. At least most of it. 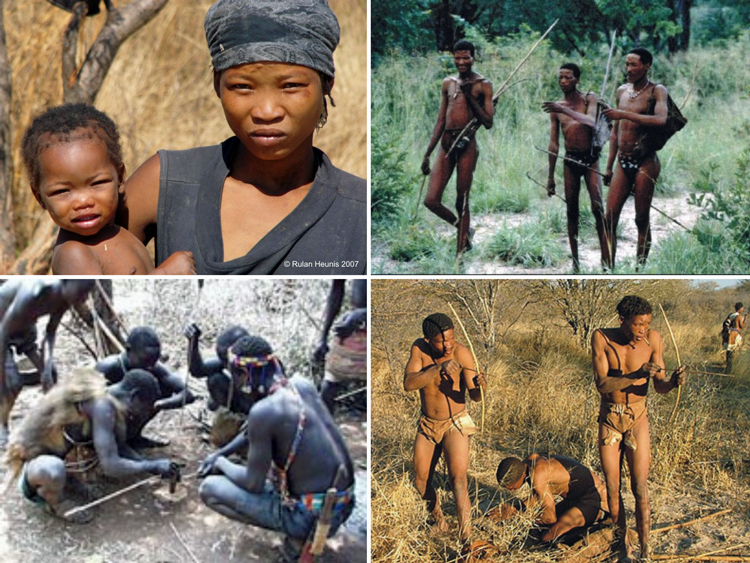 Stop a minute to imagine living as a stone-age hunter-gatherer; dressed in animal skins and living outside everyday. Sun, rain, and wind. Digging roots with a stick, and chasing down deer with a spear. Hands in blood and dirt on a daily basis. Sitting by an open fire in the evening, the whole family sleeping together every night. Now imagine life as a well-off suburban white-collar worker. 90% of your time spent indoors. Dressed in clothes bought at a store. Working on a computer. Hands soft and clean. Wearing deodorant. Picking up plastic-wrapped dinner at the supermarket on the way home. Watching the nature channel on a plasma TV, maybe going mountain biking on the weekend. The kids tucked away in their own rooms each night. Where on this continuum is your life? How about your dream life? I think white people are so afraid of the world they don’t want to see, feel, smell or hear it. The feeling of rain and snow on your face, being numbed by an icy wind and thawing out before a smoking fire, coming out of a hot sweat bath and plunging into a cold stream, these things make you feel alive, but you don’t want them any more. Living in boxes which shut out the heat of the summer and the chill of the winter, living inside a body that no longer has a scent, hearing noise from the hi-fi instead of listening to the sounds of nature, watching some actor on TV having a make-believe experience when you no longer experience anything for yourself, eating food without taste – that’s your way. It’s no good. Yeah…when I first read those words, I have to admit they stung a bit, then tingled. They stung and tingled like only the truth does. But the more time I’ve spent diving into nature then coming back to mainstream America, the more it seems to me that the goal of the American way of life is to shield us from as much reality as possible. We shield ourselves behind a wall of stuff. And media. And division of labor. Only about 2% of Americans farm anymore (though, to be fair, a much larger number of us do grow food in gardens). At best, 5% of Americans hunt. Only about 1% of Americans build shelter, and an even smaller percentage make clothing. The fundamental realities of life are food, clothing, shelter — and most of us just don’t do them anymore. Then we use phrases like “the real world” to refer to the economy. As if green pieces of paper with presidents faces printed on them were more real than meat and blood and roots and dirt and wind and rain. As if the lawyers or bankers who live in the suburbs and make enough money to drive Mercedes are somehow more successful in “the real world” than the cash-poor back-country hicks who get their hands mucky hunting, fishing, growing a garden, working on their old beater trucks, building shacks and raising snot-nosed kids. But we’re told that the great thing about modern civilization is that it’s “freed” so many of us from having to do these very things. So we can do what, exactly? Well, from what I’ve seen we fill life with trivial pursuits. Most of us work less-than-meaningful jobs, we kiss our bosses butts, and we shop. We watch TV, mow lawns, and hang out on Facebook. As if the basic necessities of life were things best avoided. Because “life is good” is mostly just true in small doses. Maybe on the weekends, after a few beers. And then we feel empty inside. And wonder why. But what if life really is good? What if there is nothing more worthwhile in this world for a man to do than feel hunger, hunt, and bring meat home to his family? Or for a woman, than to be a provider, to dig roots and pick berries — to feed, clothe, and shelter her children? Living lives devoid of so many of these “fundamentals”, it is no surprise that we are so dissatisfied with life. It is also no surprise that our culture perpetuates alienation and the dissatisfaction it creates in people. Why else would someone voluntarily be a slave but that we are convinced that the key to satisfaction, freedom, and happiness is the little green slips of paper we are issued for our work. So out of touch that we believe that truly free lives are nasty, brutish and short, we slave away at our jobs so that we can pay corporations to give us mass produced forms of shelter, food, clothing, transportation, communication, entertainment, etc. The only freedom that gives us is the freedom of choice as to which corporation we will pay to take our power from us! Worth mentioning is the involuntary slavery that is rampant as well. If you know that life is good, our culture will most likely lock up or destroy your subsistence base, thus giving you no other choice but to join the money economy. Not to be a downer, but living a “good” life usually involves becoming a bit of an outlaw. “the goal of the American way of life is to shield us from as much reality as possible.” – so true! speaking as someone so happily shielded for so long. I actually mention these types of things in my classes, even in reference to having to go to a butcher instead of getting shrink-wrapped packages at Walmarté…. anyway, thanks Glen. I really needed this. I’ve been leaning towards what I hope is a more ‘real’ way of life anyway for a while. I recently took a big hurtful hit at work, and I’ve been pretty torn up about it, but at the same time realizing that I could really be happy living in the middle of the forest with the people I love, hidden away from but not ignorant of the outside world, and not looking to allow my income to define if I am happy or not. In this culture it’s a hard lesson to learn sometimes. But I just keep thinking, hey, humanity rarely traveled more than a few miles away from home until very recently. So what if I can’t travel and experience other cultures, if I can build my village with the people I love, that’s all that really matters. And if that ever happens, I really need to learn how to be self-sufficient and sustaining (hunting, gathering, making clothing, all those things). And hopefully not getting myself eaten by a larger predator in the meantime. I want to go back to the cave, not to escape this wicked world, but to really live in it. Thanks for the comments David and Marlon! Good points all. And glad these words could be an encouragement to you today Marlon…look forward to maybe hearing about some of your adventures in the near future! I think it is absolutely true that we need to be connected – to dirt, sun, water, trees, other beings, seasons, the Earth – in order to be content. In order not to feel empty inside. It feels so good to make things homemade, by hand, whether it’s food or clothing or furniture. My dream is that all my “stuff” would be made by someone I know. Of course, I’d have to get rid of all my books, so I’ll probably never live out that dream entirely! 😀 But to head in that direction, where every “thing” is infused with meaning, where daily activities produce deep satisfaction of needs and desires, where I’m in touch with the elements, that’s the way for me. Nice! It’s a good direction to move in, for sure. And like you, I’ll probably never relinquish my books either…but to move in that direction is a wonderful thing. Thanks for the comment Elena. I have felt this way for so long I can’t even remember..The way society “is” never made any sense to me at all. I still have the dream of building my own super adobe home, with other super adobes housing family members and friends. We will have food gardens, gathering outings, hunting,fishing, wood cutting, etc. etc. I have skills too! My problem is that I don’t want to do this all by myself….no one close to me is willing to cut the cords of only surviving in this current society. I am 56 right now…so I wonder if time is running out for my dream.